In addition to our computer repair and maintenance work, Thunderbolt Technologies also supply limited runs of top quality computer systems to businesses and the general public. Our systems are made with the highest quality components. 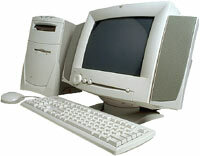 We know from our day-to-day work how vital reliable computers are to businesses! And because we stand behind everything we sell, we include a full 2 year return to base warranty on all new computer systems (software excluded) as standard. We also offer an optional 12 month or 24 month on-site warranty as an extra. That is, if any hardware component (software excluded) in your system box or monitor fails within 12 or 24 months of purchase under normal use, we'll come to your premises and repair or replace the faulty component absolutely free of charge. Ask us about it! You can view our current specials on brand new systems, refurbished ex-lease systems and laptops below (and if you're looking for a good computer system you may want to bookmark this page since our offers change frequently! Just press CTRL+D).